The global Pentecostal wave, now more than a century old, is one of the most exciting movements of God's Spirit in Christian history. At the same time, much of this movement is disconcertingly detached from the great tradition of Christian theology and in need of deeper reflection upon Christian theological history. Jonathan Black's work Apostolic Theology goes a long way towards meeting this need. It is a book that reflects profoundly on Scripture, listens carefully to the great thinkers of the early church and the Reformation, and engages thoughtfully with various strands of modern Pentecostal thought. Most importantly, the book clearly ties every aspect of Christian faith to the relationships that characterize God’s own Trinitarian life. As Black puts it, believers are “well-beloved sons in the well-beloved Son.” It is a pleasure to recommend this book. If it is true that theology underpins our every thought and action, then it follows that our theology should be as sound as it can be. 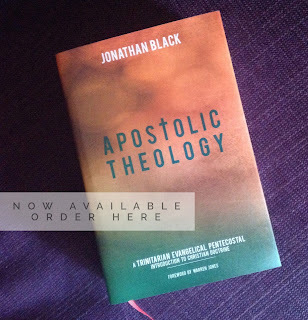 Jonathan Black's 'Apostolic Theology' is an outstanding and contemporary contribution to our understanding of what the Scriptures say to us about the essential foundations of the Apostolic Church, a global movement of churches which is both evangelical and pentecostal, and which recognises that the fivefold ministries of the New Testament era are present in the church today. 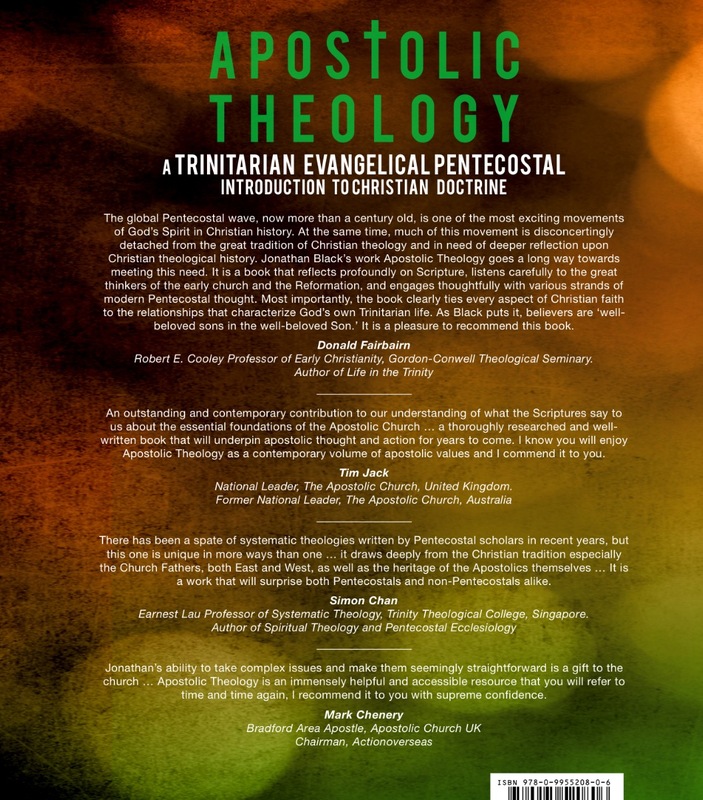 The publication of 'Apostolic Theology' coincides with the centenary of the Apostolic Church in the UK and in it Jonathan, with great care and skill, describes core doctrines and fits them into a matrix of theological understanding, giving each due weight, proper attention and appropriate balance. The result is a thoroughly researched and well-written book that will underpin apostolic thought and action for years to come. I know you will enjoy 'Apostolic Theology' as a contemporary volume of apostolic values and I commend it to you. I frequently delve into the archives of Jonathan's Apostolic Theology blog to find help with my own theological questions. To have this practical resource in one volume is invaluable. Jonathan's ability to take complex issues and make them seemingly straightforward is a gift to the church. That teaching gift comes to the fore when he writes comprehensively like this. His logical reasoning means that you not only gain clear understanding of what the church believes but also why accepting one doctrine necessitates the exclusion of others. This approach future-proofs the book as it helps us to see the heresies of the past and how they frequently resurface under a new guise to subtly draw us away from the true revelation of Jesus. Nowhere is that more clearly seen than in the chapters on the personhood of Christ, where Jonathan skilfully explains Jesus Christ as 'God the Son in his own flesh', whilst demonstrating the inadequacy of our salvation when we deviate to the slightest degree from the biblical God-Man. 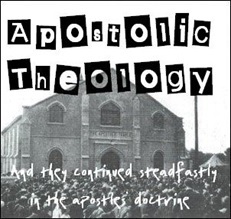 Apostolic Theology is an immensely helpful and accessible resource that you will refer to time and time again, I recommend it to you with supreme confidence. Jonathan Black takes us on a tour of key scriptures and important thinkers from church history, steering us through heresies and councils, hymnody and creeds. The destination is the truth that from the manger to the ascension, the person in action is God the Son himself. Jonathan leads us to wonder at the glory of Jesus Christ, but also leads us to great enjoyment and comfort, showing how all this was 'for us and for our salvation'. I hope many will read and benefit from this rich but accessible introduction to the incarnation. It was a great delight to get stuck into the chapter on the Resurrection of our Lord. Jonathan has the gift of getting right to the heart of the matter without skimping in arguments grounded in the Word of God. In an age where the Lord's resurrection is no longer very politically correct, Jonathan powerfully and relevantly reminds us that Christ's resurrection is the essential foundation of the message of the Good News and of the Christian faith. I can't wait to get a copy of the full book for my holiday reading! There has been a spate of systematic theologies written by Pentecostal scholars in recent years, but this one is unique in more ways than one. It is an exposition of the “tenets” of faith of a classical Pentecostal denomination little known outside the United Kingdom: the Apostolic Church, but it draws deeply from the Christian tradition especially the Church Fathers, both East and West, as well as the heritage of the Apostolics themselves. Jonathan Black thus shows that the early Pentecostals were more catholic in their theological vision than many modern Pentecostal theologians realize. It is a work that will surprise both Pentecostals and non-Pentecostals alike. In this chapter, Jonathan Black provides an accessible and instructive orientation to the Apostolic doctrine of salvation, and especially its focus on believers' deifying transformation through Spirit-effected union with Christ. No doubt, many readers will be surprised by what Black describes. But he takes pains to show that the doctrine is not only deeply biblical but also vibrantly resonant with traditional Evangelical and Patristic teaching. Black's careful work is sure to bring to light aspects of Apostolic spirituality and theology that have never been fully appreciated, and just so to provoke readers both inside and outside the global Pentecostal movement to new lines of theological reflection and construction. The writer has opened up the subjects of this chapter in such a way as to encourage the reader’s interest to know more. The concept of Christ being busy on behalf of His children is well worth meditating upon. Although English is not my first language I was able to grasp the truths being discussed and indeed enjoyed being taken deeper in my understanding of these truths.We should be grateful to God for this kind of writing which brings Apostolic theology to the more ordinary person. I look forward to being able to read the whole book. General Secretary, The Apostolic Church, Malawi. Jonathan Black is clearly captivated with the glory of the eternal Son. Let him draw you, biblically and passionately, to see the Saviour afresh. You won't be disappointed.